"Sometimes the math looks ugly. But really, there’s a strong aesthetic in theoretical physics ... and the Einstein equations are beautiful. And so often in my experience, nature wants to be beautiful." Context: Broderick was speaking at the press conference about how the EHT's results proved Einstein right yet again. Even though Einstein did not believe black holes existed, his theory of general relativity describes how they function. Why it matters: This reveals how theoretical physicists like Broderick view Einstein's theory of general relativity, and how it's held up over time. He went on to say that further exploration of black holes, using the EHT, may yield new information that runs counter to Einstein's findings. An important way to prevent depression relapse could be to figure out how to maintain parts of neurons in the brain known as dendritic spines, according to a study out today, Eileen Drage O'Reilly reports. The study in mice, published in the journal Science, examines ketamine, an antidepressant that's getting a lot of buzz. Why it matters: Depression affects nearly 20% of Americans — 80% of whom will endure a relapse after remission and 30% of whom will have treatment-resistant depression. Ketamine has been lauded for alleviating treatment-resistant depression in an extremely short amount of time — but the side effects are quite serious, no one knows exactly how it works, and the positive effects don't last long. What they did: Study author Conor Liston tells Axios the research team essentially did two experiments after the first one found "the formation of synapses are important ... but not in the way we thought." The ketamine had a positive effect on depression and led to increased neural activity in about 3 hours, but the new synapses did not form in the brain until 12 hours or later, says Liston, associate professor of neuroscience and psychiatry at Cornell. They then joined with the University of Tokyo, which developed a new imaging tool to watch dendritic spines in neurons in mice, which were stressed to produce reactions similar to depression in humans. What they found: Stress caused the mice to lose some synapses in their brains, but these were mostly restored after given ketamine, Liston says. The tool then erased the newly formed synapses to see how behavior changed — and the mice reverted to their prior "depressed" behavior. What they're saying: Liston says the findings indicate that ketamine's antidepressant effect could last longer if interventions can be created that enhance and protect the new synapse formation. "Studies like [this one] are absolutely critical for understanding ketamine's novel mechanism of action so that we can develop next-generation versions of ketamine that are even safer and more effective," David Olson, assistant professor at UC Davis who was not part of this study, tells Axios. Why it matters: The far north is undergoing profound changes that are affecting the rest of the world, from the melting of permafrost, which releases greenhouse gases, to the disappearance of sea ice. The big picture: To understand how unusual and consequential Arctic warming is, one need only to look at recent events in Alaska, which this year experienced its warmest March on record, and warmest October through March. In fact, Alaska has had its warmest 6 years on record, too. The likelihood that Utqiagvik (formerly known as Barrow) would reach those March average temperatures was just a 1-in-250,000 chance of occurring in a given year, Snider tells Axios. March is no fluke. “It doesn’t appear to be a one-off if you do the stats,” Snider says. The bottom line: A new Arctic has emerged during the past 40 years, and Alaska is experiencing that firsthand. "This report is part of an emerging genre of climate reports sounding the claxon that the future is now in terms of virtually all observable Arctic climate indicators." Scientists announced a preliminary success in devising a cancer "vaccine" that was able to help prime the immune system to attack lymphoma cancer tumors in some patients, leading to a period of remission, according to a small clinical study, Eileen writes. Why it matters: Indolent non-Hodgkin’s lymphoma (iNHL) tends to be a slow-growing cancer that is incurable with standard therapy and responds poorly to a newer type of treatment called checkpoint blockade. 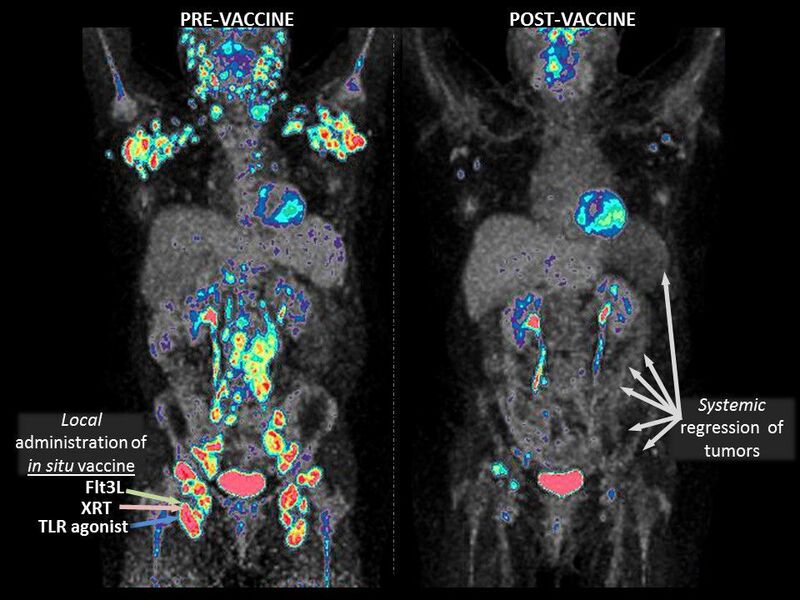 Scientists are seeking ways to broaden the response of immunotherapy to more patients, and a therapeutic cancer vaccine is one option they're chasing. Background: Dendritic and T-cells both play powerful but distinct roles in the immune system. Dendritic cells detect an infection or cancer cells and alert the T-cells to attack en masse. But cancer cells often elude discovery by the immune system for a variety of reasons. What they did: The trial, which began in 2013 and was published in Nature Medicine Monday, tested a three-pronged attack as part of the treatment. The tests were done first in animals and then in 11 human patients, most of whom had iNHL, says study author Joshua Brody, director of the lymphoma immunotherapy program at the Icahn School of Medicine at Mount Sinai Hospital. The components recruit dendritic cells to the tumor and help the immune system identify the threat by activating the body's detection system. The ultimate goal is to have T-cells proliferating and spreading throughout the body to kill any cancer cells. Go deeper: Read more of Eileen's story. Why it matters: Had it not crashed, Beresheet would have been the first privately funded spacecraft to land on the moon's surface and the first for Israel. In spite of the failure, this historic mission shows that space is slowly but surely becoming more and more accessible. The big picture: SpaceIL — the non-profit behind the mission — wasn't backed by a government, but instead raised money for the mission through donations from wealthy philanthropists. Only the U.S., China and Russia have successfully soft-landed on the moon. The mission also highlights just how difficult it is to successfully launch a relatively inexpensive mission to the moon. Background: SpaceIL originally conceived of the mission to compete for the Google Lunar X Prize — a $30 million contest to encourage private industry to pave a commercially-sustainable path to the moon. That contest ended without a winner in 2018. "We didn't make it, but we definitely tried," said Morris Kahn, one of Beresheet's financial backers. "Space is hard, but worth the risks. If we succeeded every time, there would be no reward," NASA associate administrator Thomas Zurbuchen said on Twitter. Copious amounts of winter rainfall led to one of the biggest blooms of wildflowers in the California desert in years. The flowers were so abundant and bright that they were visible from space. This photo, however, was taken at a far lower altitude, from aboard a NASA T-34 airplane flying above the Antelope Valley of California on April 2. It was published on NASA's main website on April 10 and shows both yellow wildflowers and orange poppies, which is the state flower. Thanks for reading! See you back again next Thursday. Have a great week!